Going through the holiday season during your grief recovery period can be challenging and painful. The thought of not having your loved one around can turn family gatherings into stressful events, especially if your family have particular traditions that involved the participation of the loved one. During this holiday, if you are having a difficult time acknowledging your loss, we recommend that you think about creating a small healing ritual as a part of your grief recovery. Connect with a few close friends and family members that you feel safe and can be vulnerable with and remember your loved one during this special time of the year. You can also have this small ritual by yourself, whatever makes the most sense to you. The benefits are that you may feel more connected and grieve in your unique way to help you heal. When it comes to starting new rituals and traditions as a part of your grief recovery, keep it simple. Holiday rituals should bring hope, joy, and comfort to those who take part in it. It allows you, your family, and friends the room to embrace the changes that will take place in your loss. The ritual itself will serve to remind you of the significance of your loss while bringing security to you for what the future may hold. Start a conversation. If you would like to do something special to remember your loved one and would include your family and friends into the ritual, ask each person what significant memories they have of their loved one during the holidays. Conversations are a considerable part of the grief recovery process, especially if you are looking to start a small ritual to help with your grieving process during the holidays. Being flexible. Be open and prepared for the significant changes this holiday season with your loss. 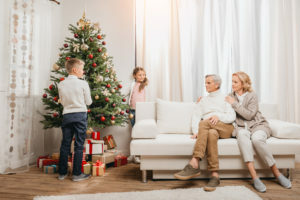 Changes can be hard, but being present in these changes will help your family stay connected despite your holiday grief. Keep holiday rituals flexible to accommodate the adjustments to your family dynamic. Otherwise, they may become more bothersome than therapeutic in your grief recovery process. Define the meaning of the rituals. Rituals become routines if they are not meaningful to your family. 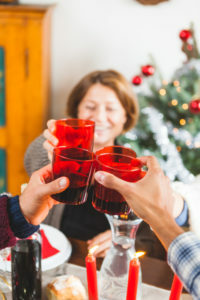 The holiday ritual should merely be a time to bring family and friends together to connect with one another. This simple holiday ritual can be done by yourself or within a group, where you can write a letter or find a special card to record your emotional highs and lows with the loss of your loved one. Reflect on your journey of grief in the past few months leading up to the holidays as well as your hopes for the future. From there you can gather a box of these letters from friends and family and do with it as you please. Whether that’s keeping it as a keepsake, burying it in a special place outside, or have one of your friends read the letters to your ritual group, this ritual will help you feel more connected to your loved one, as it also serves as a grief journal. Bond over stories with your family and friends and create a ritual group to share stories about your loved one. Have everyone in the group recall their favorite recollections and tell stories about holiday memories that involved your loved one. By sharing positive memories, you can share your loss in a loving way amongst those involved in your loved one’s life, allowing you to connect during the grief recovery process. Lighting a candle in memory of your loved one during a special holiday such as over Thanksgiving dinner or the lighting of Hanukkah candles. A great holiday ritual to honor your loved one is by giving your time or financial resources to help others. It can be giving a gift to your loved one’s name, helping others is an admirable way to pay respects to your loved one. Perhaps your loved one had a special cause that was close to their heart, why not offer a scholarship in their name or volunteer your time for that cause during the holidays? Putting your eyes on others is a healthy way to process the pain of your loss during your grief recovery period. As a part of many family’s holiday traditions, decorating for the holiday season is something to look forward to partaking. In respect of continuing the tradition despite your loss, you can create new rituals to decorate with the rest of your family. Perhaps it’s decorating a wreath with items that reminded you of your loved one or displaying pictures of happy memories of loved ones; a healing way to grief is to craft with your children or grandchildren. If you want more help and tips to enjoy this holiday season more, you can contact our therapist in Houston at the Grief Recovery Center for more info today.